Raytheon’s Enterprise Air Surveillance Radar just took a 12-hour trip down the Eastern Seaboard. EASR, the newest sensor in the U.S. Navy’s SPY-6 family of radars, recently completed subsystem testing at Raytheon’s Near Field Range in Sudbury, Massachusetts. The 6′ x 6′ rotating array was wrapped, loaded onto a flatbed truck and eventually crane-lifted onto a 100 foot test tower at the Surface Combat Systems Center at Wallops Island, Va. Once up and running, the radar will undergo system-level testing, tracking a variety of aircraft through the end of 2019. EASR is the Navy’s next generation radar for aircraft carriers and amphibious warfare ships that provides simultaneous anti-air and anti-surface warfare, electronic protection and air traffic control capabilities. 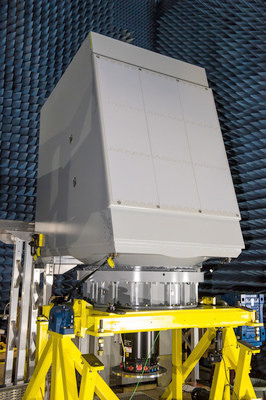 Both versions of EASR are built on scalable Radar Modular Assembly technology as well as a software baseline that has been matured through development and recent test successes of AN/SPY-6(V)1 the U.S. Navy’s program of record for the DDG 51 Flight III destroyers. Each RMA is a self-contained radar in a 2′ x 2′ x 2′ box. These individual radars can integrate together to form arrays of various sizes to address any mission on any ship. EASR also adds air traffic control and weather capabilities to the mature SPY-6 software baseline.